Guns N’ Roses and LCD Soundsystem, two of the most influential bands in recent decades, will both get back together for the Coachella music festival in April. Coachella, which takes place over two consecutive weekends in the California desert, confirmed the long-rumored reunions as it announced its lineup late Monday. 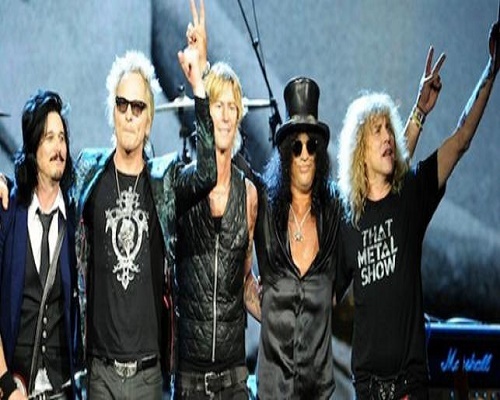 The concerts are expected to mark the first time that the original lineup of Guns N’ Roses — including singer Axl Rose and guitarist Slash — have performed together since July 1993 in Buenos Aires. The Los Angeles-based hard rockers confirmed the dates on their website with a video of a giant concert reminiscent of the band’s heyday. Guns N’ Roses have kept playing in name in recent years but without Slash, who has long said it was too difficult to work with Rose. The singer, who rarely gives interviews, had been scheduled to speak Tuesday on the late-night talk show of Jimmy Kimmel. But Rose’s name inexplicably disappeared Monday from Kimmel’s list of guests on the show’s website. With Rose’s sweeping vocal range and raw anger coupled with Slash’s intricate metal guitar, Guns N’ Roses became an instant sensation. “Appetite for Destruction” from 1987 remains the top-selling debut album by a group in the United States, where it has been certified as selling 18 million copies. But Guns N’ Roses have released just one album in the past two decades — “Chinese Democracy,” which came out in 2008 after persistent delays and without Slash. LCD Soundsystem, a younger band from New York, was influential in developing the hard-edged electronica scene of the 2000s that brought a new alternative aura to dance music. The band — best known perhaps for the track “Daft Punk Is Playing at My House,” a tongue-in-cheek homage to the prominent French electronic duo — had broken up in 2011 with a concert at Madison Square Garden that was heralded with a live album and documentary. LCD Soundsystem reunited in its own idiosyncratic way on December 24 when it suddenly released a track entitled “Christmas Will Break Your Heart,” with the band writing on Facebook that it was a “depressing Christmas song” that had been on the back burner for the past eight years. LCD Soundsystem will headline Coachella on the festival’s two Fridays — April 15 and April 22 — with Guns N’ Roses performing on the Saturday nights. The Sunday headliner of the three-day festival — whose lineups for the two weekends are generally identical — will be Calvin Harris, one of the biggest names in dance music. Other acts confirmed for Coachella include Ice Cube, a member of pioneering gangsta rappers N.W.A. in the late 1980s who — until the release of a biopic last year on the group — may have been better known to young festival goers as an actor. Rising stars on the lineup include Halsey, a virtual unknown two years ago who is selling out arenas with introspective songs and the millennial generation anthem “New Americana,” and rare Coachella country attraction Chris Stapleton, who worked for years behind the scenes at Nashville before winning acclaim for his solo debut. Coachella, launched in 1999, has emerged as one of the world’s most famous music events alongside Glastonbury in Britain amid a rapid rise of festivals in North America. But while last year’s festival quickly sold out, resale prices were comparatively modest as critics said the 2015 lineup lacked Coachella’s usual headline-grabbing power. The 2015 headliners were Australian hard rock veterans AC/DC, garage rocker Jack White and chart-topping Toronto rapper Drake.